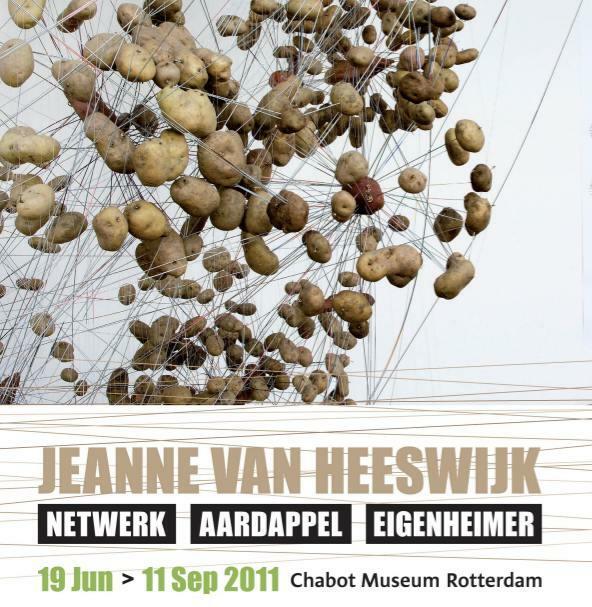 From 19 June to 11 September 2011 the video "Langs de Lijn" we made for Jeanne van Heeswijk, will be exhibited in her retrospective at the Chabot Museum in Rotterdam. The exhibition includes works Jeanne made in collaboration with: Mindaugas Arlinskas, Yun Bao, inhabitants Werthacker, Frank de Bruijn, Maurits de Bruijn, Benny Busborg, Yane Calvoski, Linas Citvaras, Floor Cornelisse, Rolf Engelen, Klaas van Gorkum, Ali Al Harbi, Iratxe Jaio, Huda Al Kazwine, Thijs Kelder, Wenying Liao, François Lombarts, Marcel van der Meijs, Jeroen Musch, Sonya Schönberger, Pia Sigmund, Paul Sixta, employees SUS, Roger Teeuwen, Siebe Thissen, Joke Tjalsma, Pieter Vandermeer, Frans Vermeer, Anique Weve and Marten Winters. En última instancia, la obra consiste precisamente en la iluminación y el cuestionamiento de una serie de procesos productivos, y no en la glorificación del resultado concreto de tales procesos. Frente a la estetización de lo político que esto supondría, Jaio y van Gorkum proponen una politización de lo estético, que no discurre por el fácil camino de la soflama ideológica, sino a través de una reflexión crítica sobre las condiciones de la propia actividad. Revelan así una vía fructífera para deslindar el arte de la lógica espectacular y fantasmagórica de la mercancía. Pocos empeños parecen más necesarios en la situación actual del mundo del arte. Hareng Saur: Ensor and contemporary art. A video of the project "Stay inside. Close windows and doors" has been selected for the exhibition Hareng Saur: Ensor and contemprary art, to be shown in Contemporary Art Museum SMAK in Ghent. A project around the changing values of labour and property, examining the notion of artistic production through the resurrection of the woodturning hobby of a retired factory worker (Klaas' late grandfather). What’s up, what’s down. Cultural catalysts in Urban Space. De studiereis van het Fonds BKVB met als titel What’s up, what’s down. Cultural catalysts in Urban Space heeft tot doel de stedelijke transformaties van de afgelopen decennia in een aantal secondary cities in Europa te onderzoeken. De reis (van 1 t/m 17 oktober 2010) zal leiden naar de Balkan (Skopje, Prishtina, Tirana), Marseille, vervolgens naar Noord- Engeland (Manchester, Leeds, Liverpool) en de Baskische regio (Bilbao en Vitoria-Gasteiz). Invited as experts in "direct democracy", we have been working with students at the HKU, during the extra-curricular seminar "Buro voor directe democratie". Having introduced them to the gentle art of trolling, they spent a week getting banned from forums and messageboards, and applying the same techniques in offline public spaces. From 19 February to 18 April, TENT. presents the group exhibition The People United Will Never Be Defeated. 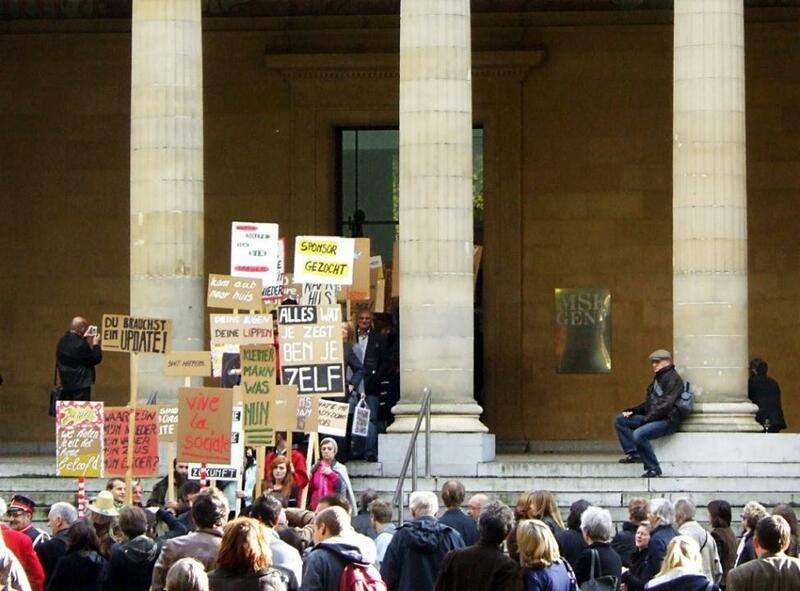 A topical exhibition around the municipal elections of 3 March 2010, in which the relationships between art and politics are critically examined. Artists have long been aware of the social implications of their work. Politicians also frequently talk about the role of art in society. A certain form of social engagement can after all be found in almost every work of art. In The People United Will Never Be Defeated it is, however, not about art demonstrating its engagement. The focus is on artists who emphatically, and explicitly, raise the issue of the political system: the voting, the speechmaking, the campaigns, the meetings, the decisions. By getting close to the politician they enter into dialogue with the established order. followed by the screening of George A. Romero’s ‘Dawn of the Dead’ (1978). A night of gore, zombie slapstick and alienated entertainment! Parallel Ports is a site maintained by the artists Iratxe Jaio and Klaas van Gorkum. It contains information about their art projects, and news about recent and upcoming activities. Iratxe Jaio & Klaas van Gorkum have worked together since 2001, producing performances, videos, publications and installations. In their practice they analyse and question commonplace notions of authorship, cultural identity and labour relations.